What does the perfect sales pro look like? Bill Good updates his description thanks to reader feedback. In the June issue of Research magazine, I published the “The Perfect Sales Professional.” In it I listed and explained characteristics I felt essential for defining sales perfection. As you will see, based largely on reader response, I have greatly expanded my list of characteristics that define perfection. But I’m not done yet. Even if you already took the first survey, please do it again. I think I’m close to defining sales perfection, but I need some more help. Go here: http://bit.ly/perfectsales2. When you are done, as a way to say “Thanks,” I will send you to a website where you can download my white paper “The Good Way to Sell.” I will also send you the survey report so you can evaluate yourself against your peers. As a disclaimer, what I am reporting so far could not be considered a scientific survey. But these are the data I have. Plus, I have many years of training tens of thousands of sales professionals. And with your help, we will come up with most of the characteristics that define “the perfect sales professional.” I say “most” not “all” because perfection, while desirable, is elusive. A couple of lessons: (1) My list of 16 characteristics was too short. I focused it, though not exclusively, on sales procedure. When asked what I missed, my readers told me I missed a lot. They pointed me to some more sales procedure characteristics, as well as personal, work habit and prospecting characteristics. My survey was a “self-assessment” on the characteristics I started with. I used the classic evaluation question, “On a scale of 1–5…” I also gathered some information on AUM, number of years in the industry and number of clients. I ran two reports: (1) You manage $100M or more. You are an excellent sales professional. (2) You manage $25M or less. You have some work to do. For each question for each group, I calculated the “mean” answer. Before I tell you my conclusion, look over the nearby table. It shows the mean answer for each characteristic for each group, and then the difference. Take a moment. What do you see? 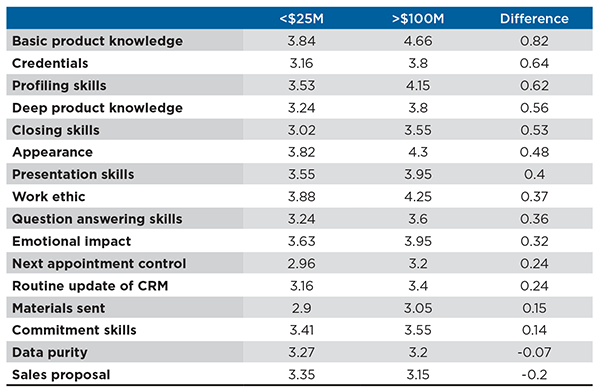 Fact: Advisors with $100M or more consistently rated themselves higher across all but two skill levels than those with $25M or less. I think one of these categories, “Data purity,” should not be included in the list of perfection characteristics and I think the other, “Sales proposal,” needs to be reworded. Conclusion: There is no “one thing” that separates the top tier advisors from those in the bottom tier. Once again, this validates my theory of best practices. Fact: Several characteristics seem to matter more than others. Interesting that product knowledge showed the biggest difference in self-assessment score. If I had less than $100 million AUM and wanted to improve my selling skills, I might start there. I learned a lot from studying the 89 suggestions for additional characteristics that define success. After weeding out nonsensical and duplicate items, my respondents made 42 good suggestions. I have combined some, tossed a couple, and am adding these characteristics to the characteristics that define the perfect sales professional. The descriptions, with some editing, were those suggested by readers. Likability: The ability to get your point across in a nonthreatening, non-slick way and allow the clients/prospects to trust and like you. Communicate persuasively: Control your tone and pace when you speak. Use strategic pauses when making a “big point.” Illustrate the concept or say an important statement three different ways or three times. Communicate accurately: The most important characteristic is communication accuracy. Proper spelling and proper word selection are key when communicating with a client. It will not make the sale, but it will certainly lose the sale. Body language: Should be calm, confident and assertive. Self-starter: Realize income is going to correlate with the number of outgoing phone calls — ability to handle rejection; no response from a client doesn’t correlate with a loss in self esteem. Positive mental attitude: I would call it mind control. When you are in a rut, how do you respond? Do you let negativity get in your way and let it fester, or do you push through it and stay positive until you are out of the rut? Ability to handle low production days — managing the highs and lows without getting down on yourself. Enthusiasm: It’s infectious. People like being around people who make them feel good. Be like your dog who is always glad to see you. Makes you feel good, doesn’t it? Caring: Build relationships of trust with the client. Show you care about their business/future. Be genuinely interested in your client’s life and how they behave. This helps deepen relationships and create more complete solutions. People love to talk about themselves and value a relationship that shows you care about them more than the sale. This requires integrity and behavior exceeding standard ethics. Listening skills: Do you really listen? Ask clarifying questions until you are certain you understand the client’s goals, values, interests, problems and fears. Never interrupt. Time blocking: Your day is structured in blocks of time. Planning: Day is planned before it starts. Execution: Plans are carried out. Follow-up: Immediate response to all prospects questions, calls, emails and requests for materials. Too many salespeople are lazy about promptly following up with whatever the prospect may need or want. Lead generation: Sufficient leads to meet your personal new client/new asset goal. Prospect file maintenance: One thing some struggle with is letting unqualified or jerky prospects stay on a list. If you’re a ‘pit hoarder,’ get better about stopping your 90 Day No Contact calls on folks that don’t have much potential. So, maybe list pruning is a skill that should be included. Handling objections: Consider questions regarding handling objections. What are the characteristics of an advisor who is successfully able to address client objections? How does one deal with “I already have an advisor,” or “I have been with my current advisor for 10 years,” or “My brother in-law handles my money”? Setting expectations: Set expectations for a good relationship, and what the client expects from the advisor. Demonstrate expertise: When meeting with the client and or prospect, bring up valuable information that is being talked about in the marketplace. A great example of this is “behavioral finance”: how our emotions can push us off our goals and long term financial plans. Appointment preparation: Produce a consistent client experience when the client comes into the office. I have revised some of the original skills. If you want the current list, take my survey: http://bit.ly/perfectsales2. There are undoubtedly a host of marketing and other skills still to add. So stay tuned for Sales Perfection 3.0.